All you need is hot water, lemon, ginger, sugar and lime. Add half a lemon to the hot water with half a lime, cover with tin foil and leave for two minutes. Then add grated ginger and sugar to taste. 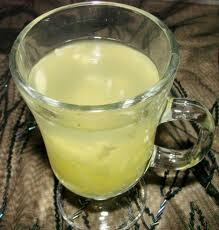 Have about five of these in the day and your cold or cough should calm down. Thanks Maria, such a simple idea that sounds really tasty and effective!! And for those that don't want to use sugar, raw honey would be a good substitute. Food really can be our medicine and Maria shows us here that is doesn't need to be complicated or expensive.